The DREAM Act was passed by the House Wednesday by a margin of 18 votes while the Senate is set to vote at 11 a. m. today. The act which has been in the works since 2001 would grant partial citizenship to illegal immigrant minors who have lived in the county for five years or more and complete at least two years in college or the military. While the controversial issue of immigration has been a hot topic in the country for years, five states already have implemented a policy like this one, including Texas and Oklahoma, Juenke said. “I would say yes to something like this, people need a chance,” MSU junior Casey Chirte said. The issue of immigration has been a hot topic for years and consistently splits legislators. Despite cold windy conditions the city of East Lansing’s Winter Bowl Soup & Chili cook off attracted a crowd of nearly 3,000 Sunday afternoon. Steps away from Santa and Mrs. Clause, crowds of chili tasters supported the charities with booths set up at the event inside the Marriot. Charities included a coat drive supporting Advent House, a letter drive for service men and women overseas, and a giving tree supporting the Boy & Girls Club of Lansing. The giving tree, run by Silver & Beyond store owner and avid Boys and Girls Club volunteer Siham Baladi , has been at tradition at the event since the store opened in 2004. “The giving tree has become so popular, customers ask about it when they come in all the time—all year round, so how can I not do it the following year when I see the response from the community?” Baladi said. Set up at a table outside the store, the giving tree has tags with names and ages of children and a item they have requested for Christmas. Tags are chosen by the public and the gifts are dropped off to the Silver & Beyond store throughout the holiday season before being picked up by the Boys & Girls Club of Lansing and distributed to the children at the club’s holiday party. Kowalk-Thompson and Baladi work together to start planning for the event in September. “Planning that we do is worth it, people feel like when they have everything they want, it’s good to share and the Boys & Girls Club helps a lot of people, and they’re overwhelmed by all the people that need help this year,” Baladi said. From chili, to chestnuts, to cocoa, to charity; this year Winter Bowl Soup & Chili cook-off served up another helping of success. 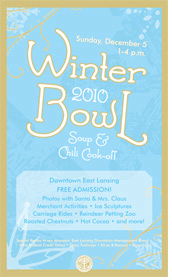 Despite budget issues early on, the city of East Lansing will host its annual Winter Bowl soup and chili cook-off Sunday Dec. 6. The event is free to the public and is held at Ann Street Plaza, Parking Lot one and the East Lansing Marriott from 1-4 p.m. According to Frey, who has promoted the holiday event since 2006, this year’s event will only experience minor changes despite the city’s financial struggles. While presented by the city, the Winter Bowl’s holiday activities are sponsored this year by MSU Federal Credit Union, Dean Transportation, Downtown Management Board, Silver & Beyond and Crunchy’s. “Silver & Beyond owner Siham Daladi was instrumental this year when there was a chance of the festival not happening at all,” Frey said. Daladi, who owns showcase gallery and specialty item store Silver & Beyond, has supported the Winter Bowl since she opened her store in 2004. Daladi runs the Giving Tree, a six year tradition at the event. Community members select names from the Boys and Girls Club of Lansing and throughout the holiday season bring in holiday gifts for their selected child to the Silver & Beyond store. 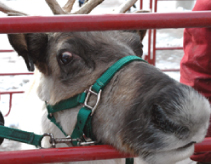 In addition to the Giving Tree, activities at the event include free chili and soup sampling, reindeer petting, horse and carriage rides, photos with Santa and Mrs. Claus, ice carving, a marshmallow roast, musical performances, roaming carolers, hot chocolate and roasted chestnuts. While the event’s plethora of activities provide something for everyone, the main attraction remains the chili and soup cook-off located in Parking Lot one, where the public can taste samples and cast their votes. The cook-off is a prime exposure for restaurants regardless of outcome, and the winning competitors from last year are set to return. Last year’s judge’s choice winner, Harrison Roadhouse plans to make the same recipe for this year’s competition. While the turnout varies each year due to the weather, the planners expect a full turnout this year. The Detroit Lions are making history. For the first time, the team will compete in the forty-fifth NFL Super Bowl on Sunday Feb. 6, 2011 at Cowboys stadium in Arlington Texas. In addition to a first time appearance for the Lions the game marks the first time the Super Bowl has been held in the Dallas-Fort Worth area. FOX will provide live coverage of the game with sports casters Joe Buck and Tony Aikman. Underdogs from the start the Lions have proved they are a competitor throughout their 16-0 season. The Lions will take on the New England Patriots Sunday to see if their fairy tale super bowl will have a happy ending. Yoga State founder and teacher Jen Hayes practice pigeon pose in the 515 E. Grand River studio. For East Lansing resident Jen Hayes, freedom was her motivation in opening her own yoga studio. “I wanted a place where I could have the freedom to teach how I wanted,” she said. Hayes, who has a background in both construction and accounting, opened Yoga State at 515 East Grand River Ave. in 2007. “Location was important—I wanted to be near Okemos, East Lansing, and Haslett and I was set on being on Grand River for the easy access to students since there was nothing around like this for them,” she said. The studio offers the lowest rates in Michigan, and goes out of its way to cater to MSU students, offering reduced rates and bulk packages that never expire. This adds a level of flexibility that makes it easier for people to fit yoga into their schedules. “We try to make our pricing as low as possible so that more people can come,” Hayes said. While the studio depends on their MSU student clientele, MSU students say they feel the same way about the studio. “I’m dedicated to yoga because it helps me with school work, classes and keeping me relaxed. I actually depend on it to get me through the week,” MSU communications junior Kelly Clark said. Clark, a former member of the MSU crew team, was seeking a fresh challenging workout like what she was used to from intense rowing practices, and found Yoga State during her sophomore year. “It depends on where you go, but Yoga State yoga is so much more than just stretching, like a lot of people think. It’s as intense as what I was used to with crew and the studio gives off a vibe that makes it even more than a workout—it helps you mentally as well as physically,” Clark said. Although yoga’s physical benefits may be more well-known, the emotional benefits of yoga are abundant as well. “It teaches you how to deal with confrontation while physically keeping you at your all-around best,” Hayes said. Whether it’s the physical or emotional benefits of yoga that lures students to attend classes, Yoga State attracts 30 to 60 students each day. Classes include ashtanga yoga, a tradition practice combining the same sequence of movements in every class; vinyasa yoga, where breath and movement combine to create a unique fast paced flow, and apprentice classes, five-dollar classes where newly trained instructors have the opportunity to teach. Times range from early morning to late evenings, Monday through Sunday. “I try to practice six days a week–it’s pretty easy to go since its at the same time each day. I want to try everything so now I can’t stop coming,” Clark said. In addition to the nine regular Yoga State instructors, the studio hosts workshops and events monthly hosting yogis from everywhere from Miami to New York City. In October, the studio hosted Justin Barns, from The Jonny Kest Center for Yoga in Bloomfield Hills, who taught a special vinyasa class, and Saturday the studio will welcome ‘Yoga Dan’ to teach an Ahimsa yoga class at 5:45. Yoga State provides a comfortable environment for both skilled yogis coming in for workshops and new yogis trying the ancient art for the first time. From the studio’s handcrafted tile floor in the entryway to its large fish bowl in the front to the cork floor in the studio designed to hold in heat, Yoga State provides a unique professional environment for everyone. “I couldn’t find a place with the right environment, there were always, windows, and mirrors and it was not welcoming, emotionally, so we had to build it,” Hayes said. Hayes, who formerly taught at the Michigan Athletic Club, wanted a peaceful environment that was worlds away from the noisy busy gym atmosphere she was used to. Her dream became a reality with Yoga State where she has been able to share her love for yoga with much of the community, but taking the first steps to starting her own business was as challenging as holding a difficult pose for ten minutes. “I didn’t think about it too much, I couldn’t over think it or I would’ve talked myself out of it. I’m still thinking about it,” she said. While most of Yoga State has not changed drastically since they opened, they are still constantly developing and making minor changes, including adding new classes. One of the main challenges for the studio, like most college town businesses, is the summer, Hayes said. “The fluctuation of when the students leave and the families are vacationing is really hard. We offer specials during that time and market to the neighborhood more,” she said. With whatever challenges Hayes faces, she, like many other Yoga State regulars, uses yoga as a tool to overcome whatever she faces. “I treat yoga as something I have to do so I make time for it like a club or sport or school or work. I don’t think I could get through the semester without it—I think everyone should try it,” Clark said. After cranking on the heat and breaking out winter coats last week, Mid-Michigan residents are embracing the return of indian summer temperatures this week. With a highs the low sixties through Thursday, residents can store their jackets for a least a few more days. While highs for the week reach sixty lows remain in the low thirties Monday and Tuesday. Skies will be mostly sunny throughout the week, until Saturday where scattered showers are expected, bringing temperatures down for the rest of the weekend. For the weekend and the week ahead, temperatures will top out in the upper forties with low temperatures nearing freezing.